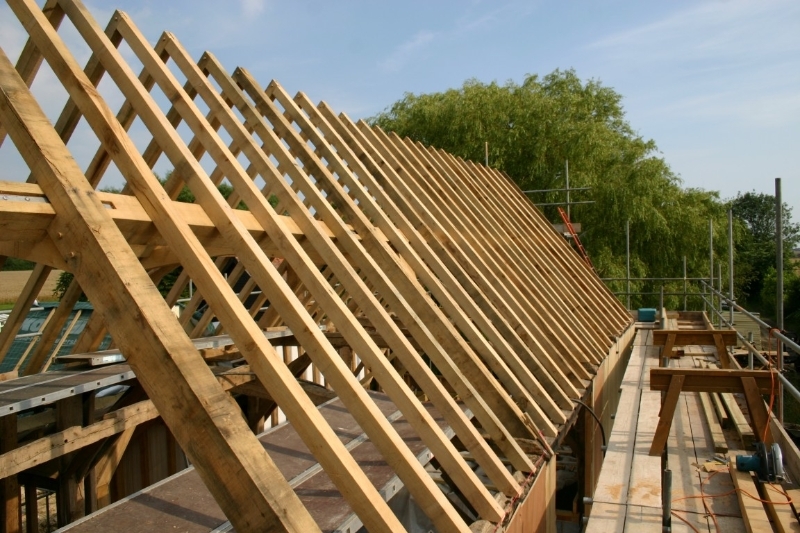 This has been the latest challenge; replacing a inferior softwood roof with a traditional green oak framed roof. On the face of things it sounds pretty simple, but the barn has seen a significant amount of movement over the years. It is in a very prominent position, taking centuries of battering from the predominantly South-Westerly winds. The barn is currently being converted to residential use, subsequently needing to satisfy building regulations. Therefore a a degree of structural repairs have been carried out, plus underpinning and new plinth walls. Even after all this work the building was left significantly ‘wonky’! The wall plates and tie beams are neither level (over 1ft front to back! ), parallel, square or plumb. In fact it is simpler to say that nothing is right at all. The barn is curtilage listed, which implies that it’s exterior appearance is kept relevant to the surroundings. This gave us a little flexibility when exploring different roof styles, settling with a simple and elegant clasp purlin design. 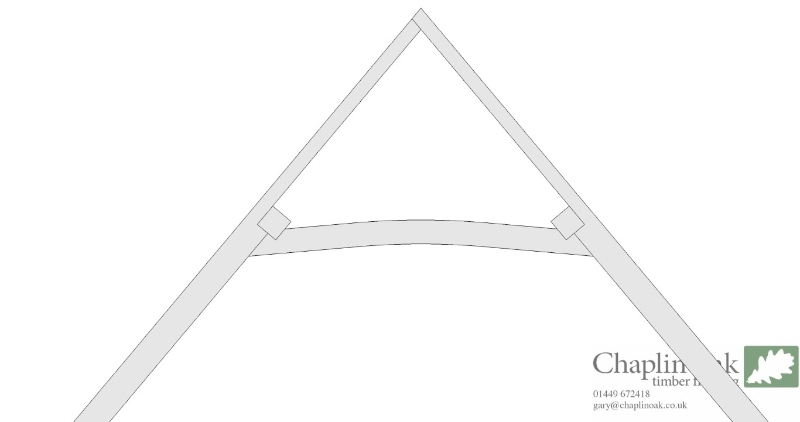 The following illustrates this in a truss. 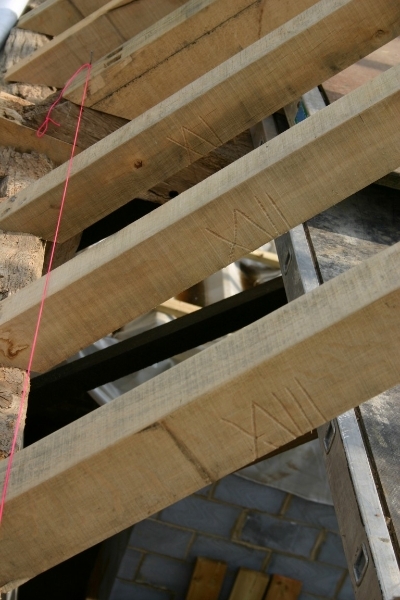 Given there were four of six tie beams still in existence, it made sense to use these to land each of the rafter feet on. Adding two new tie beams at the gables, locking the frame together as it should be. Just to make the fitting a touch more complex 🙂 , the pitch was to be kept at 50° and the ridge height to be maintained level throughout. So after careful design the following is how the roof looks in plan. 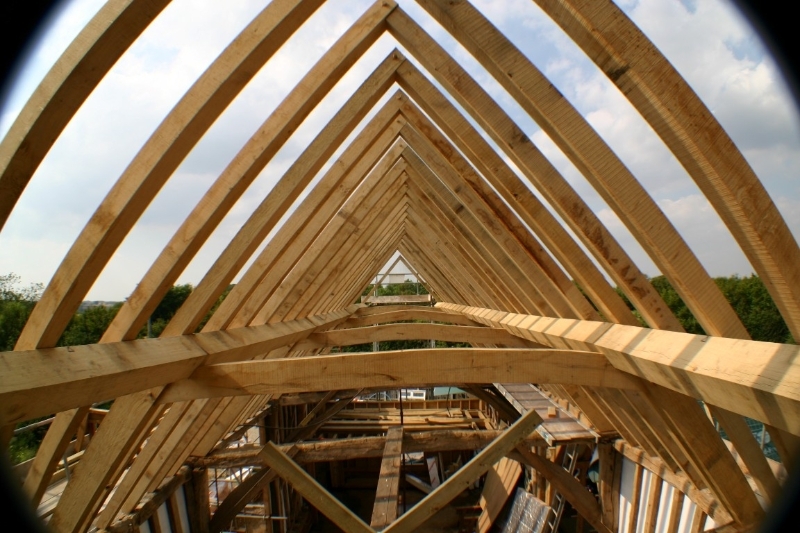 The primary trusses were framed up in the usual way, each being different to the next. The only thing that stayed the same was the collar height from the ridge. 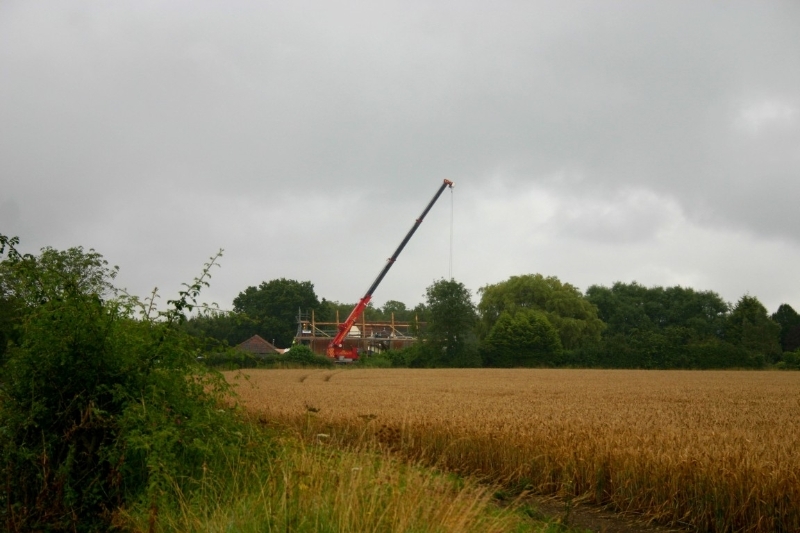 This was necessary as only one day had been allocated to crane the primary timbers in place. We used a timelaspe camera to record this process. 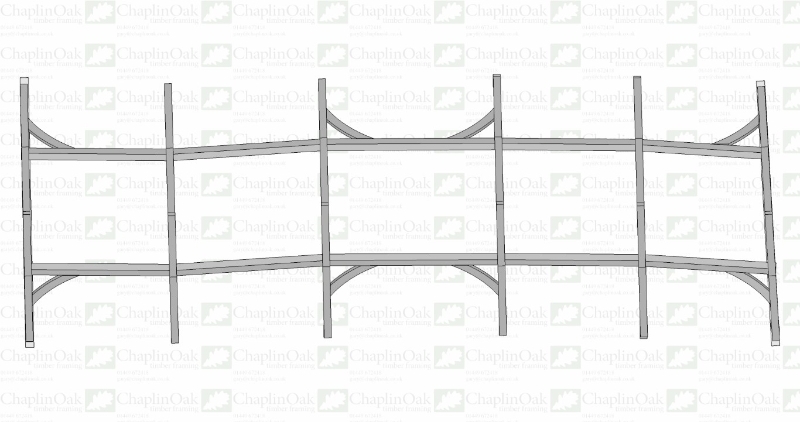 From the following picture you can see the waviness of the purlin run, note that each purlin is a different length so that it is picked up exactly half way on the collars. 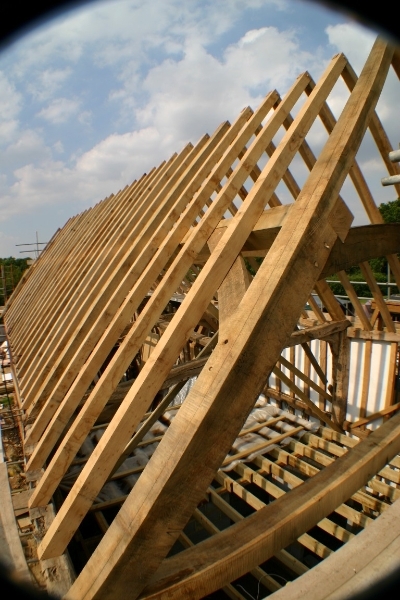 Here are some more pictures showing the effect on the common rafters, each of which is cut separately in order to keep the roof pitch the same between primary trusses. And some traditional numbering just for fun! 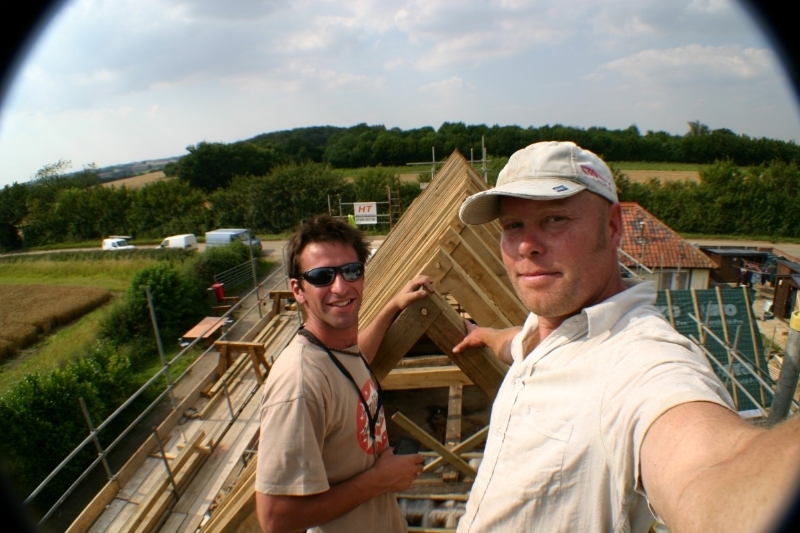 Finally, the raising team: Matt (left) & Gary.